Today was a day of exploring the underbelly of the city. The day started off with shopping for goodies to take home to family and friends, and once that was done, we stopped for a cup of tea and very tasty muffins at the Elephant House. While that might not sound impressive, it is the birthplace of Harry Potter. It has one of the most interesting bathrooms. 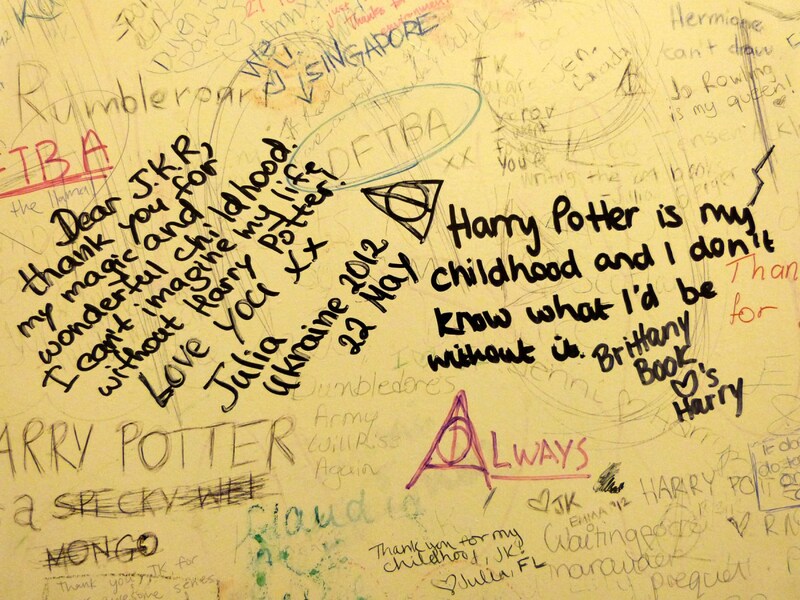 Since the books have been released, and the Elephant House has been put on the map, people have felt the need to leave Harry Potter themed messages on the walls, the toilet, and even the mirrors. From there we continued on to The Real Mary King’s Close and took a tour of the underground part of the city. I’d been on the tour before, but I still enjoyed going underground to see the parts that used to belong to the city. Unfortunately there are no cameras allowed, so we don’t have pictures, but thanks to the internet, my loyal 7 readers can enjoy a quick glimpse of the Close. Close means street, or in the case of the city, the alleys that are between the main streets. The next stop of the day was to the best/worst tourist attraction ever: The Edinburgh Dungeon. It was cheesy, it was scary, and it provided me with one of the funniest pictures I have ever seen of myself. At the end of the adventure there is a ride that drops you much like Tower of Terror at Disneyland (but on a smaller scale). I was in the middle of talking to my favorite Frenchwoman when we dropped, and I had mouth open scream of terror. I actually look like I am afraid….thankfully that picture will only live in the minds of those who saw it today. I’m glad the other two members of my faithful trio were able to go and then hang out with my family. From there we moved on to a little pub off the beaten path for a quick drink. I was able to convince my BFF here to pop over and hang out for a bit. He was a very good sport about it, and didn’t even blink at the Rubber Pirate Chicken. That is the true sign of a BFF. The night ended at one of my favorite eateries for a warm meal and some deep fried haggis. Problem was, the waitress wrote down the wrong order, so my dad will have to wait until tomorrow to get his haggis. I keep trying to tell him he isn’t missing anything, but he really wants to try it. Tomorrow is my last day with my parents. Other than lunch with some of the girls in my class, I am not really sure what the day will hold. If it is cold, like it was today, I may try to talk them into a museum, but if the weather is okay, then I am going to take them to see the best view of the city. Then it will be back to business as usual here and back to paper writing and dissertation prep work. Not really looking forward to that. It was so much fun meeting many of your friends today. You have always had a knack of choosing wisely when it comes to friends…hence the support you got in March. These are definitely people you will know for the rest of your life.